Form meets function, efficiency complements performance and technology bolsters comfort with the fourth-generation Toyota Avalon. The Car Connection's 2014 Avalon review isn't shy about saying that after a complete redesign last year it's become "the one to beat." 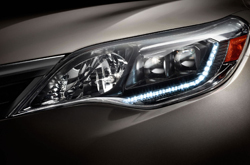 And with improved efficiency, a beautiful new design and the addition of a hybrid model it's easy to see why. Plus this year the 2014 model offers enhanced value with an extended features list. Shoppers in the tri-state area can find the 2014 Toyota Avalon for sale in Evansville, Indiana at Kenny Kent Toyota. Gas-only models are offered in four trim levels: XLE, XLE Premium, XLE Touring and Limited; the Avalon Hybrid is available in all but the XLE trim. For 2014, every model now comes standard with a rearview camera; XLE Premium trims receive Display Audio with Navigation and Toyota's Entune App Suite; and the XLE Touring gets new 18-inch alloy wheels and an optional Blind Spot Monitor. Avalon's new design shows off many attractive details, from dual-lense quadrabeam headlights to specially shaped underbody panels that assist in reducing turbulence underneath the car. The cabin also received a comprehensive update and is outfitted with meticulously crafted features like leather-trimmed seats, French stitching and soft-touch materials throughout. Other notable changes took place under the hood, where Avalon received many enhancements that helped boost fuel economy. Its V-6 delivers a class-leading 25 mpg combined and the Avalon Hybrid, which debuted last year, offers efficiency that doesn't forfeit performance with 200 horsepower and 40 mpg combined. 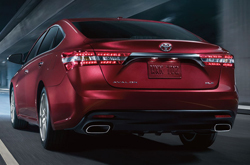 Visit Kenny Kent to test drive the 2014 Toyota Avalon in Evansville, Indiana! Stop by during business hours or schedule an appointment in advance by calling or filling out our online contact form. In the remainder of our Toyota Avalon review, you'll find additional vehicle specs and a video walk-around tour of the car. 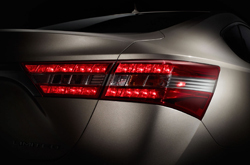 The 2014 Hyundai Azera, Acura TL, Ford Taurus, Chrysler 300 and the Buick LaCrosse are no match for the 2014 Avalon! Just compare Toyota's most current model side-by-side with them and you'll realize that it out does the competition easily. The Avalon's user-friendly features and budget-friendly MSRP are just a few of the appealing attributes that shoppers will be thankful for. Many drivers in Evansville choose it because it's a phenomenal value; compare its price to the vehicles listed above to see for yourself. The bullet list under this text will give you even more info! Make the search for your next car a breeze with Kenny Kent Toyota's reviews, like the 2014 Avalon overview above, as well as other Toyota reviews in our gallery. We take our responsibility to provide the best reviews authored by automotive experts - it's just one more thing that makes us a prominent Toyota dealership in Evansville. To make wise decisions when it comes to your next Toyota purchase, don't guess! Each paragraph is crammed with material, including info about vehicle features, in an easy-to-understand format. After checking out Kenny Kent Toyota's review of the new Avalon, message us to schedule a test drive and find out about great lease offers!